You've probably heard about this ingredient—sodium lauryl sulfate (SLS). There's been a lot of media coverage on it lately, especially in the world of natural and organic skin care. So what's the real story? Is this ingredient truly detrimental to your health? Should you be avoiding it? This chemical is a combination of sulfuric acid, monododecyl ester, and sodium salt mixed together to create a soap-like detergent that also has excellent foaming properties. 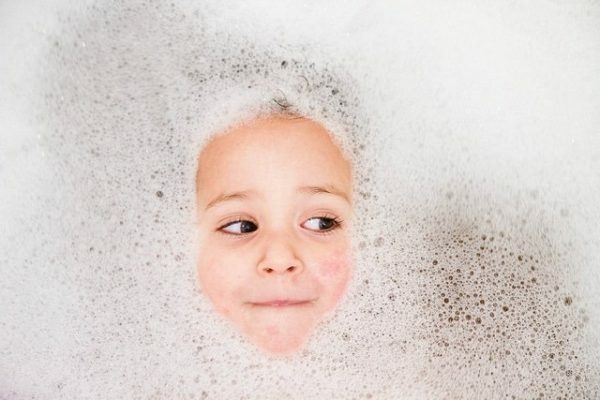 SLS is used in shampoos, body washes, toothpastes, soaps, facial cleansers, shave creams, bubble baths, and more—any product that we expect to “foam up.” In fact, most households probably contain five or more products that include this chemical. SLS is also used in floor scrubbing and degreasing solutions, engine degreasers, car-wash soaps, and for other industrial applications. There are several concerning issues with this ingredient, particularly since SLS appears in so many of our everyday products. First, it's irritating. A report by the Journal of the American College of Toxicology noted that concentrations of 0.5–10% of SLS caused slight to moderate skin irritation, while 10-30% caused skin corrosion and severe irritation. In addition, the ingredient is routinely used in clinical studies to deliberately irritate skin, so that healing solutions can be tested. Right there that's enough to make me want to keep this stuff away from my skin! They also reported eye irritation, which comes into play specifically with SLS-containing shampoos. That's not all. In the same report, toxicologists stated that SLS “had a degenerative effect on the cell membranes because of its protein denaturing properties.” Protein denaturing means that the structures of the proteins in the skin are disrupted and possibly destroyed. Skin aging as a result of sun exposure is believed to occur because of protein denaturation. In other words, SLS can age the skin. Problem number two! Finally, the same report noted that SLS can easily penetrate the skin to burrow into the deeper tissues and even the bloodstream. “High levels of skin penetration may occur at even low-use concentration,” they noted. This is especially concerning if SLS causes other health issues, which many suspect that it does. What a lot of people are especially concerned about is that SLS can be contaminated with carcinogenic nitrates. I spoke about these in a former post about diethanolamine compounds. SLS can react with other ingredients in personal care formulations, especially when exposed to air, to create these nitrates, which because of the skin penetration, may then work their way into the body. If you use this product briefly and rinse it away, as is the case for most SLS-containing products, you're supposed to be safe from any adverse effects, according to most safety regulating agencies. The truth is, however, that we don't have enough studies yet to determine the long-term effects of exposure day after day to several products with the ingredient. My recommendation would be to avoid this wherever you can. The nice thing is that it's right there on the label. Just choose products that do not have “sodium lauryl sulfate” on the ingredient list, or any other sulfates, as they have similar effects. Fortunately, there are several SLS-free products out there now—including all Annmarie Gianni Skin Care products. Do you avoid SLS? Please share your thoughts. “7 Final Report on the Safety Assessment of Sodium Lauryl Sulfate and Ammonium Lauryl Sulfate,” Journal of the American College of Toxicology, Volume 2, Number 7, 1983. http://www.docstoc.com/docs/2423844/JOURNAL-OF-THE-AMERICAN-COLLEGE-OF-TOXICOLOGY. “NICNAS Existing Chemicals Information Sheet,” Australian Government Department of Health and Aging, October 9, 2007. http://nicnas.gov.au/Publications/Information_Sheets/Existing_Chemical_Information_Sheets/ECIS_sls_PDF.pdf. Photo courtesy Widescreen Wallaby via Flickr.com. YES. I always, always avoid SLS. That’s one of the reasons why I love your products! Safe, luxurious, and they work! Is it a dead give away for a product that contains SLS if it suds up? Are there any non-toxic, non-harmful sudsing agents out there? How are Sodium Lauryl Glucose and Lauryl Glucoside different from Sodium Lauryl Sulfate? Thanks for your help.